SAN FRANCISCO--(BUSINESS WIRE)--Today, Medical Information Records, LLC (MIR), creator of AnesthesiaOS, a revolutionary Anesthesia Information Management System (AIMS) company that offers a robust, one of a kind AIMS built for mobility, intuitiveness and speed; announced that it was selected as the winner of the inaugural Healthcare Pitch Days competition sponsored by Dell Healthcare and Life Sciences and the Dell Center for Entrepreneurs. 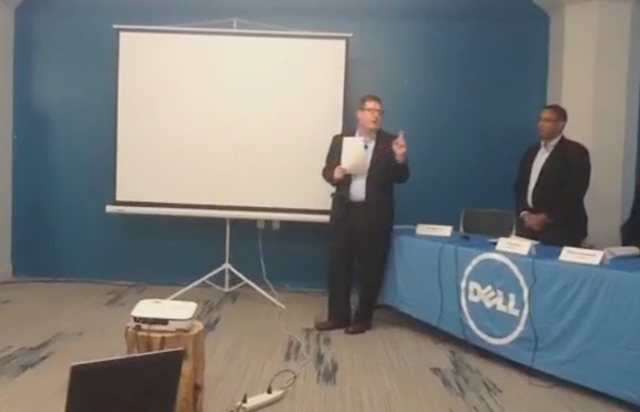 The Healthcare Pitch Days competition is part of Dell’s larger Tech Innovation Day Series. Powered by Intel, the Tech Innovation Day Series provides a unique opportunity for startups to get their businesses in front of some of the most influential people in the industry. This year marked the launch of the healthcare version of the Tech Innovation Day Series which was developed to encourage innovation and entrepreneurship in healthcare. Dell and Intel partnered on this initiative in an effort to find innovative healthcare and life sciences startups who are developing mobile applications and technologies that improve patient outcomes. The challenge showcased some of the best and brightest ideas that have the potential to change the way healthcare is delivered, while leading a conversation about transformative technologies. Following a series of pitch events in Austin, New York City and San Francisco during the months of April and May; MIR and six other finalists were selected and invited to the final pitch event in San Francisco where MIR was crowned the winner. In the final pitch, entitled “Advancing Medicine”, co-developer of AnesthesiaOS, Dr. Christopher Ray detailed how AnesthesiaOS provides a fully mobile AIMS solution that not only creates greater efficiency in practice management and workflow but also incorporates revolutionary features that help improve patient outcomes and increase patient safety. Describing AnesthesiaOS’ customizable business intelligence engine and the large scale data aggregation, Dr. Ray wowed the judges and attendees as he explained how AnesthesiaOS adopts some of the same trend and pattern learning that’s done by companies such as Facebook and applies it to a hospital setting. Relying on cloud based networks of providers across the world with vast amounts of clinical data, AnesthesiaOS provides a platform for physicians to leverage machine learning in order to gain real-time insights which will assist the physicians as they administer care. This will allow facilities and providers to harness big data to deliver smarter care and thus take one step closer to personalized medicine. After the big win, judge and Intel Capital representative Bobby Kandaswamy stated, “AnesthesiaOS is an extremely promising solution with a founding team with great expertise and understanding of the needs of the market.” In addition to publicity and feedback from experts at Dell, Intel and other collaborators throughout the process, MIR will also receive a prize package including the latest Dell tablets, coaching/mentorship and the opportunity to enhance the capabilities and reach of the product. AnesthesiaOS is truly the future of AIMS as it transcends how electronic medical records (EMR) are viewed today. AnesthesiaOS is a cloud-based EMR that will allow any provider to easily complete an anesthesia record while focusing on the quality of patient care and not merely documentation. AnesthesiaOS is designed to enhance the point of care, not control it. Developed by anesthesiologists for use by hospitals, surgery centers, and individual providers; AnesthesiaOS is the only EMR formulated for speed, intuitiveness, and mobility. It can be utilized to perform operating room cases via a web portal, personal computer or tablet device and provides EMR enhancements and improvements in such areas as cost containment, risk management, and data informatics. For more information about AnesthesiaOS, please visit http://anesthesiaos.com, Twitter, YouTube and the AOS Blog.